when I'm debugging my app, I cannot see the values of the properties of some classes. When I get the value using "po runObject.title", the correct value is displayed. Tex, what version of Xcode does AppCode run with? 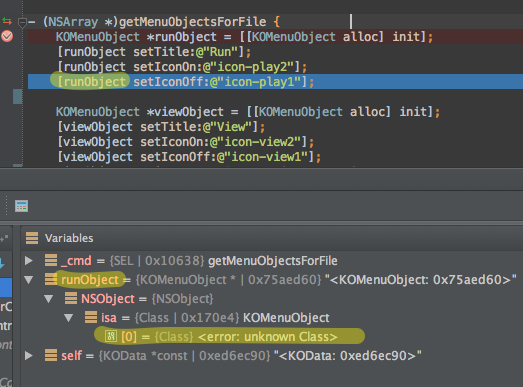 We'll update LLDB version in the next AppCode 2.5 EAP, it should fix the issue. I have the same problem with AppCode 2.5 EAP and XCode 5.0 (5A1413). But I'm pretty sure that this already worked with XCode 5 before. It's not working since yesterday. Is there something else I maybe have misconfigured or the like? In XCode the debugging works without problems. New eap build will be available in a few days - we work flat-out. Thank you, I appreciate your great work. But is this really a problem of updated XCode? With the update of XCode from 4 to 5, I also changed to AppCode 2.5 EAP. And as said before, I'm of the mind that it already worked? Am I wrong? Or did I change any setting that causes this? If I put the same object in the watch list, it works fine. Tex, the best way to report the bugs is our tracker; could you please file one and attach a sample project?